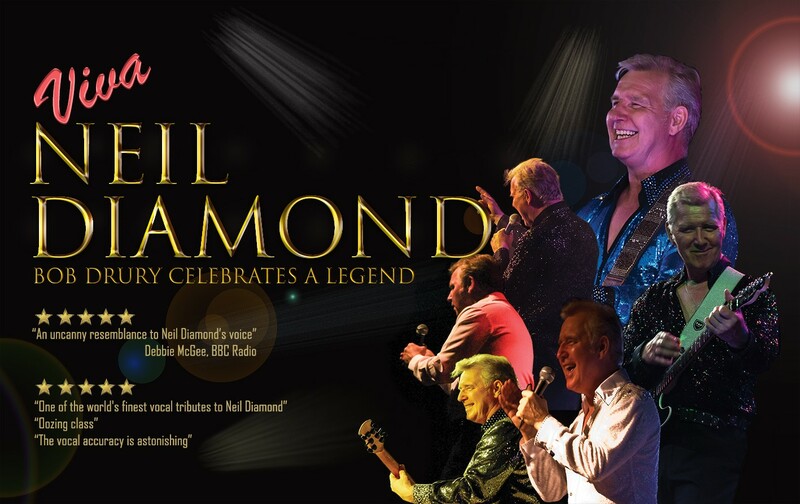 Whilst performing in Las Vegas two years ago Bob Drury was described "one of the world's finest vocal tributes to Neil Diamond" and he's now back touring the UK with his new show celebrating the legendary Neil Diamond and his incredible back catalogue of songs. Bob Drury's one-man show is an absolute 'must-see' for any Diamond fans. Prepare to be blown away by his vocal likeness which has been delighting audiences around the world. "An uncanny resemblance to Neil Diamond's voice. That sent tingles down my spine Bob!" "Bob, it was great hearing you last night and I was totally blown away by your level of musicianship on guitar"
"Bob is well established as one of the world's finest vocal tributes to Neil Diamond"
"Neil Diamond fans will be delighted with the sound-alike quality and the nifty guitar work"